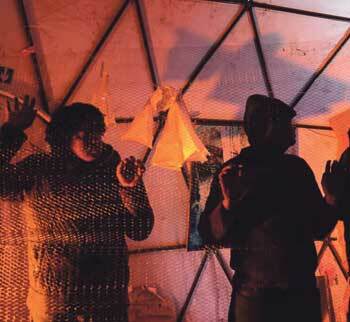 Where to now for Calais Jungle’s Good Chance Theatre? If there weren’t already enough theatres on London’s South Bank, it’s about to get a little more crowded. Take a walk down by the Thames in the coming weeks and you may pass a mostly white, alien dome slap-bang outside the Southbank Centre, every reachable bit of canvas covered in vibrant graffiti. This is the Good Chance Theatre, and, until four months ago, it was pitched in the Calais migrant camp more commonly known as the ‘Jungle’, where it was run for and with refugees. The theatre was the brainchild of playwrights Joe Robertson and Joe Murphy, who only 14 months ago were in Manchester finishing off their latest play: a story about a refugee woman and her new life in the UK. Struck by the inescapability of the refugee crisis and determined to help out in some way, the pair travelled to the camp last year and realised they had to build a theatre. But it didn’t just appear overnight. After their first trip to Calais, the Joes – as everyone refers to them – returned to the UK and “passed the hat” around the theatre world. They called on contacts they knew – Sonia Friedman, Stephen Daldry, David Lan, Ian Rickson – and some they didn’t, including the Royal Court’s Vicky Featherstone, asking for any help they could provide. 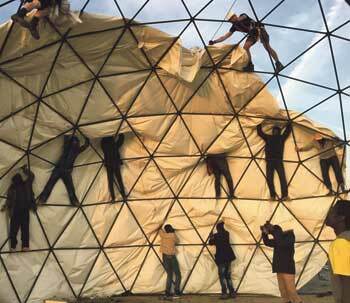 After buying the dome for £5,000 from “the eBay of second-hand tents”, the Joes went back across the channel to erect the theatre in September. Refugees in the camp flocked to help, and, when finished, stuck around for an after-party. Murphy says it was “unlike anything” he had experienced: approximately 300 people were inside the tent, dancing, singing national songs, rapping – and there were more on the door trying to get in. That first night became a template for the community feel the theatre aimed to offer. Morning to night, the building was open for people to participate in drama, music, writing, painting, poetry, mime – initially facilitated by the Joes, later by refugees who came with their own ideas. Word got around, and a huge number of companies offered to perform and host workshops at the theatre – Kneehigh, Cheek by Jowl and Shakespeare’s Globe among them. 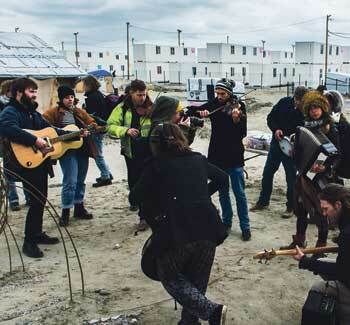 The latter added a date in Calais to its global Hamlet tour, performing outdoors to a crowd of hundreds. Robertson says it struck a deep chord. A few times, the battles got so close that tear gas blew into the theatre. “Everyone cried a bit,” Robertson says, “but we were safe in that area.” At this point, Murphy cuts in. “By the end, that was different,” he mutters, bitterly. The theatre itself was safe from eviction; the refugees living in the camp were not so lucky. The French interior minister promised the camp clearing would be done “progressively, by persuasion and with respect for people’s dignity”. And then the bulldozers came. In March, Murphy told The Stage the camp had become a “war-zone”. There was only room for around 750 more people in the government’s shipping container camp. More than 2,500 people – nearly 300 of whom were unaccompanied children – had nowhere to go. 1. A circus tent was initially considered, but deemed too garish for the camp and too culturally specific. 2. The company Robertson and Murphy bought the dome from, Noisy Toys, came with them to Calais, helped set it up, and also provided lights, flooring and a sound system. 3. The tent was forced to move within the camp several times. Murphy said building the tent was as important as running it because “it was a communal thing, everyone was part of it”. 4. The theatre founders lived in the camp, while they paid for volunteers to stay in static caravans off-site. 5. Robertson and Murphy didn’t run the theatre alone. Royal Court community producer Chris Sonnex became a core member of the team, alongside others including head of volunteers Jo Ostrom and director Daniel Raggett. So, in March, the dome came down – but not without a promise to return. “We knew we would be back in Calais, because we saw the difference we made,” Robertson says, with frank determination. The theatre’s founders promise it will be rebuilt in the container camp “very, very soon”. But their work doesn’t stop in the meantime. 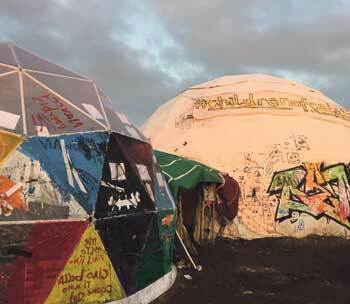 They pitched the dome at Glastonbury Festival in June, and are working on a virtual reality film with the National Theatre using 3D footage filmed in Calais. Then there’s Encampment: a nine-day arts festival outside the Southbank Centre that will see the theatre pitched right by the River Thames. Refugees from Calais who made it across the UK border will be among performers taking part in music, dance, theatre, spoken-word events and debates, alongside renowned refugee artists from around the world. 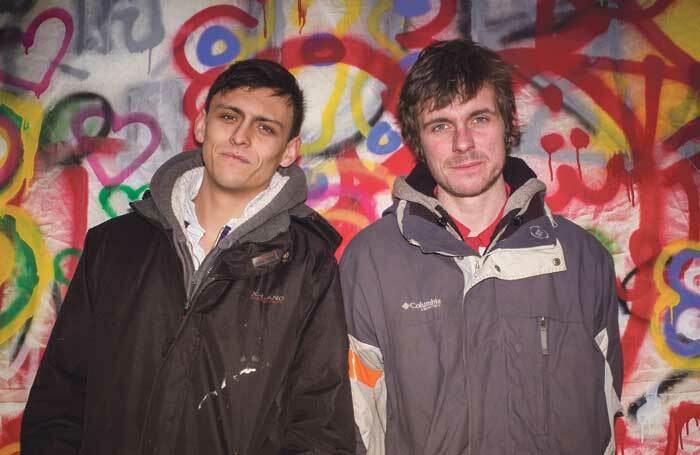 Murphy and Robertson have been workshopping a new play with refugees they knew in Calais. “So there’s a lot on,” Murphy concludes, redundantly. Some will have questioned the use of an arts centre where people’s lives are often in direct peril, particularly in a climate where theatre is often seen as a very middle-class luxury. But Murphy argues it is essential to make us feel human. “If you believe that theatre is important in our lives, then you have to believe it’s important for those people. There’s no difference between those people as human beings and us,” he says.